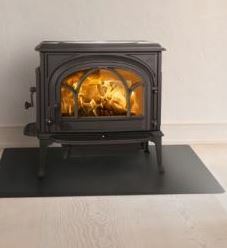 Description: Jøtul has taken great pride in redesigning their most popular wood stove, the F 500 Oslo. Without sacrificing function over form, Jøtul has managed to keep all the technical aspects of the F 500 Oslo while modernizing the look . A minimal arched front now creates an even larger, less cluttered fire view, while the same minimalist design to the sides, ashpan and top striking the perfect balance between contemporary style and classic arches.